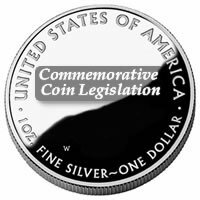 Legislation has been introduced in the United States House of Representatives seeking to direct the United States Mint to strike silver commemorative coins in honor of the U.S.S. Cruiser Olympia. Entitled the U.S.S. Cruiser Olympia Commemorative Coin Act, H.R. 3180, the proposed legislation would allow up to 500,000 $1 collector proof and uncirculated silver coins to be released in the year of 2016. This new legislation was introduced by Rep. Robert Brady, D-PA, who represents the area where the vessel is berthed. As of this writing, fourteen other members of the House of Representatives have opted to cosponsor the commemorative act. According to H.R. 3180, the designs featured on the Olympia Silver Commemorative Coins are required to be "emblematic of the courage, pride, sacrifice, sense of duty, and history of the U.S.S. Cruiser Olympia." Inscriptions would include the face value of the coin (one dollar), the year of its release (2016) and the other standard inscriptions found on silver commemorative coins (Liberty, In God We Trust, United States of America, and E Pluribus Unum). Proposed designs for the dollars (if approved and signed into law) would likely be made public sometime in 2015. These design candidates will be reviewed by the Friends of the Cruiser Olympia, the United States Commission of Fine Arts and the Citizen’s Coinage Advisory Committee before a final selection is made by the Secretary of the Treasury. Each strike would feature the standard specifications found in modern commemorative coins. This includes a weight of 26.73 grams, a diameter of 1.5 inches and a composition of 90 percent silver and 10 percent copper. A surcharge of $10 per coin will be collected on the sale of each silver dollar with the proceeds forwarded to the Friends of the Cruiser Olympia for the purpose of restoring and preserving the cruiser. "This is a worthwhile project that will help to ensure that this naval treasure remains afloat," Congressman Brady said in a statement following the introduction of the proposed legislation. The U.S.S. Olympia was commissioned in 1895, two and a half year’s after being launched. She serves a unique place in the history of American war ships for several reasons, including the fact that no sister ships were built like her. The vessel also holds the distinction of being the world’s oldest floating steel warship. However, the ship is perhaps most remembered for her role in the Spanish-American War, of which she is the sole surviving naval ship from those engagements. During the war, the Olympia served as Admiral Dewey’s flagship at the Battle of Manila Bay which marked the entrance of the United States as a world naval power. She also served during World War I with her last official naval mission being the transport of the body of the Unknown Soldier from France in 1921. The U.S.S. Cruiser Olympia Commemorative Coin Act has been referred to the House Committee on Financial Services. It must pass both the House of Representatives and the United States Senate as well as be signed by the President of the United States before it can become law.